This delightful children’s book offers simple answers to a child’s earliest questions on prayer. It begins to explain how we can communicate with an infinite God who loves us and created our hearts to love! The personal joy of this supernatural relationship is presented through simple language and colorful illustrations. ~Kimberly Cook, – on the inspiration for writing Mommy, Mommy, When You Pray for her own son. Mommy, Mommy, When You Pray will actually be there at the World Meeting of Families. Families are often attacked for their faithfulness to God, and it is difficult to remember the blessings of the vocation God has given us, especially in the midst of a world that clings to comfort and selfishness. As a mom living the vocation of family life, I wanted to leave my children with a positive encounter of gratitude – especially for the simplicity of the beauty found in the everyday. This book sums up this ordinary gratitude in simple, and colorful language, penetrating little ears and eyes and hearts. It is now my hope and prayer that this same book can bless your children – instilling in them the virtue of joy and thanksgiving, and planting in them the positive idea of family life. Despite the challenges and hardships of serving others, there is always great joy and blessing in doing so! The genesis for this little book of thanksgiving came late one night after about a million things ran through my mind, and sleep seemed to be the furthest thing away. I decided to use the time for prayer, since it was the most productive thing I could do at the time. My mind turned to my young son – how he had observed me praying, and began asking questions. The Holy Spirit was moving in me, and I knew he was drawing my attention to this lesson for a reason. As a parent, I desire to be faithful to prayer for own soul, but also for my children’s souls. They are always watching and imitating, and kids can tell when things are genuine, or just for show. I started reflecting on what I wanted my children to know about my prayer life. I hoped that they saw the joy, peace, and consolation I received in prayer. I also wanted them to know that I talk to God about them! About how to raise them to be men and women of God, how to give them a Godly example, how to discipline them as the Psalms have laid out, and how to create a house of peace and prayer, so that they may go forth into the world, and know how to return to God in prayer at any moment. Our children are blessings, just in being who God made them to be. Sometimes they know this intuitively, and sometimes they need to be told and shown through our love. Mommy, Mommy, When You Pray helps little ones realize just how worthy they are of love and of the great thanksgiving for their lives. They are made for such greatness, and created to be brought into such a mysterious divine love story. This book is for moms in the midst of the struggle of motherhood, as a reminder of the good they are doing. And for children, who are filled with innocence, hunger for God, and the need to know they are always loved! 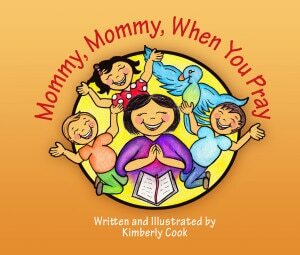 “I recently discovered your book “Mommy, Mommy, When you Pray” after seeing a positive review Lisa Henley gave it on Amazon. “My 3 year old daughter loves it when I read it to her and even walked up to me in the kitchen and said, “Mommy, what’s in your heart? What do you say?” It’s a darling little book and she likes the happy pictures and will not let me close the book without talking about the picture of your sweet family on the back She also is especially fond of the jumping on the bed page . “Kimberly taps into that spiritual potential. Rather than crushing their God given spirit, she knows just how to celebrate their innate spirituality and how to coax it to the surface. This little story will open up dialogue between you and your child; for the two of you share what you are thankful for, and why. Kimberly Cook has a knack for capturing the everyday occurrences of life and highlighting them as special – worthy of thanks! Cook has a lot of love packed into 24 pages.